Pinnacle Advanced Compound is the safe and easy solution to removing gloss-hindering paint imperfections, like swirl marks, scratches, and water spots. Featuring the most advanced abrasive technology ever offered in a compound, Pinnacle Advanced Compound carries true to its name by offering an advanced, systematic approach to defect removal. Pinnacle Advanced Compound brings “user-friendly” to a whole new level. You will not find a more easy to use compound that delivers such outstanding cutting and finishing action. Advanced Compound has a long, smooth buffing cycle. ...and it wipes off like butter. Compounds are arguably the most painstaking car care products to formulate, because the chemists must create a formula that offers outstanding cutting action without sacrificing finish quality. This is more difficult than it sounds, which is the reason why the finish quality of most compounds leaves a lot to be desired. 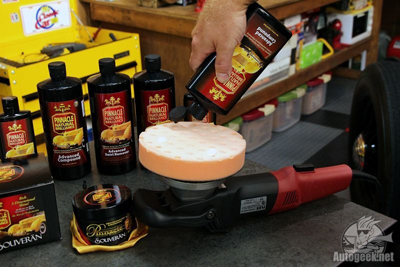 Through years of strenuous research and development, Pinnacle formulated a compound that offers the true cutting ability of a compound, with the finish quality of a fine cut polish. The result is Pinnacle Advanced Compound. 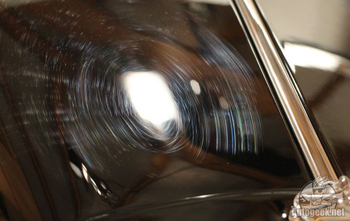 Abrasives are the component of the compound that is responsible for removing swirls and scratches. There are two types of abrasives – those that are mined and those that are engineered. Mined abrasives are dug out of the earth and then filtered using a screening process where particles fall through different filters, separating the various sizes. This process has been the industry standard for decades, and while it has evolved to become more advanced and the quality of the abrasives is better than they used to be, they still pale in comparison to engineered abrasives – the type found exclusively in Pinnacle Advanced Compound. Engineered abrasives are created in tightly controlled laboratory. The advantage to this type of abrasive technology is that the chemists can control the size, shape, sharpness, hardness or softness, and breakdown rate of each and every abrasive particle that goes into Pinnacle Advanced Compound. This ensures better quality control over mined abrasives, where no two abrasives are exactly the same. The result is the ability for the chemists to create a compound that offers both excellent cutting and finishing qualities. Pinnacle Advanced Compound will not scour or haze your paint. 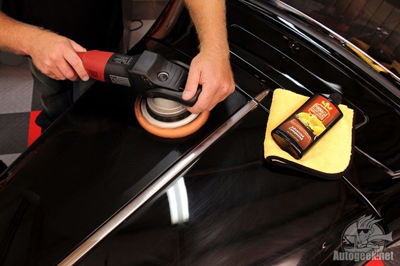 Pinnacle Advanced Compound offers more than outstanding cutting and finishing qualities – this body-shop safe compound offers a long buffing cycle and easy wipe off. Pinnacle Advanced Compound can be applied with a dual action or rotary polisher using foam, wool, or microfiber pads. Pinnacle Advanced Compound also works great for removing defects by hand in difficult to reach areas! Though some would describe the cutting ability of Pinnacle Advanced Compound as aggressive, since it can effortlessly remove 1200 grit sanding marks, the finish that it leaves behind rivals that of the finest cut polishes. With that being said, amazing is the only word necessary to describe the cutting and finishing qualities of Pinnacle Advanced Compound. Pinnacle Advanced Compound is so easy to use that anyone can make their vehicle look like a show car! 2. Pour several dime-sized drops of compound onto a light cutting pad. You may also apply the compound directly to the vehicle (rotary polisher) or in a circle on the pad. Spread the polish over the area you intend to polish with the machine turned off. This will reduce splatter. 3. Set the maximum speed on a dual action polisher to 5 or 6. If you’re using a rotary polisher, set your speed between 1000 and 1200 RPM. Set the pad on the paint and turn it on. Work in a side to side, then up and down motion until the polish starts to turn clear. 4. Make sure the polisher is off before lifting it off the paint. 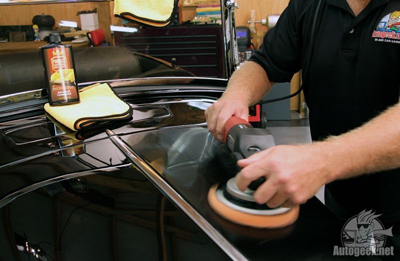 Remove residue with a Gold Plush Jr. Microfiber Towel to inspect your results. If swirls are still visible, repeat the process. 5. 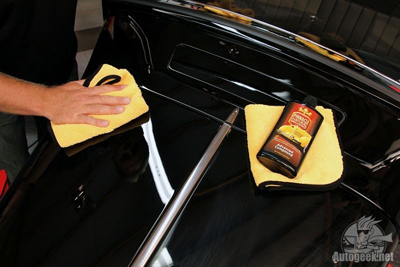 Always follow Pinnacle Advanced Compound with Pinnacle Advanced Finishing Polish. 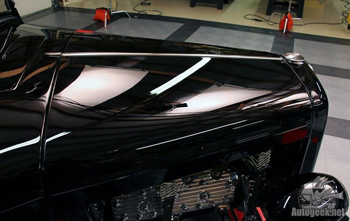 This ultra fine polish further enhances the gloss and reflective quality of the paint. Then finish off the paint with a coat of one of Pinnacle’s show car waxes: Souveran, Signature Series II, or Liquid Souveran. 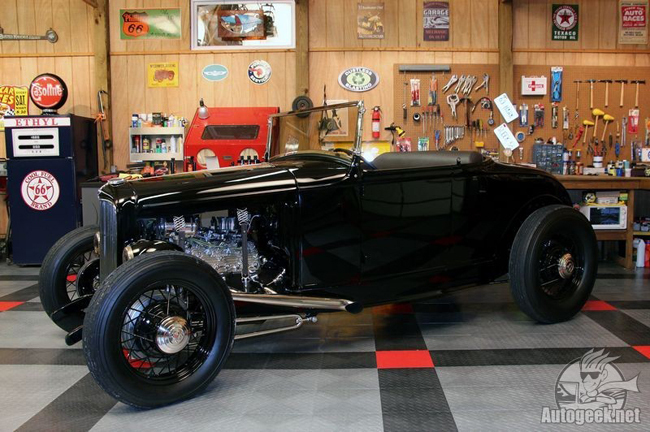 1931 Ford Highboy on the set of My Classic Car with Dennis Gage, where Pinnacle Advanced Compound was used to remove the swirl marks and scratches, Pinnacle Advanced Finishing Polish to create a mirror finish, and Pinnacle Souveran to impart a dazzling, 3-dimensional shine. Pinnacle Advanced Compound 16 oz. Pinnacle Advanced Compound 32 oz. Pinnacle Advanced Compound 128 oz. EASY TO USE GREAT PRODUCT.